This Wraith sword is full size at a whopping 52" long. Its really very big and very heavy. Its made of stainless steel with a suede handle. It comes with an ornate wooden display plaque. It is brand new and comes in a box. The Wraith sword is a full size sword measuring 52 inches tall and weighing 2000 grams. The cross guide is made of metal and is shaped in a way which looks like thorns. 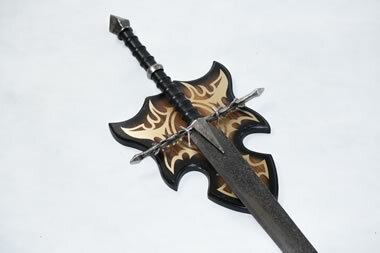 The handle is covered in a dark black leather and a metal ring in the middle of the handle splitting it up into a 2 handed sword. The pommel of the handle is also made of metal and is shaped like a diamond. The blade is not the average shiny silver colored blades, the blade looks as if it is an old battered and rusted swords which has been polished. Great sword. Identical to those in the movies, very detailed ..